Preheat oven to 375 degrees. Line a baking sheet with parchment paper or aluminum foil. Wash the vegetables. Cut the squash in half vertically. Scrape the seeds out and discard. Cut each half into about 4 chunks for a total of 8 pieces. Cut the unpeeled onion in half vertically. Cut 1/2 inch off the top of the garlic head, exposing the cloves. Arrange the garlic, squash, and onion, cut side up, on the baking sheet. Drizzle with olive oil, sprinkle with thyme. Cover dish tightly with foil and bake until the squash is tender when pierced with a knife, about 45 minutes to 1 hour. 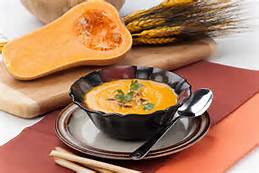 After vegetables have cooled enough to handle, scrape squash off of the skin and into a food processor or blender. Discard the skin. Peel the skin off of the onion and trim the root and add the roasted onion to the squash. Separate 9 to 12 of the garlic cloves and squeeze the soft garlic in with the vegetables. Add any juices that have collected in the baking pan. Add 3 cups of broth and puree the mixture until smooth. Add extra broth as needed to achieve your desired consistency.